Since my role changed from Development to Investment, I don’t get out so much to meet co-ops without appraising their suitability for a loan. So it was with some pleasure that I got to attend Ways Forward 7 in Manchester recently. Ways Forward was set up about five years ago as a response to the crisis at the Co-op Bank. Over the years they have had some high profile speakers including Ken Loach , Rebecca Long-Bailey and John McDonnell. This year was no exception with MEP Molly Scott-Cato on the agenda. How local authorities can facilitate a co-operative culture, in particular, what Preston are currently doing. The report by the New Economics Foundation proposing that the co-operative economy be doubled, including a fascinating presentation by Les Huckfield. Les was one of the prominent MPs responsible for the Industrial Common Ownership Act in 1976 which helped ICOF (now known as Co-op & Community Finance) with finance to lend to co-operatives. Les, a passionate supporter of worker co-ops, has seen much of what the NEF is now proposing before in the 1970s and 80s and it’s good to know that he is now advising John McDonnell. How mature housing co-ops can come together having paid off their mortgages to create new Housing co-ops and ensure that they stay mutual. All interesting positive stuff, but one of the great benefits for me of being allowed out to conferences like these is the opportunity to network – talk to borrowers (old and current) to see how they’re doing, talking to co-op development people to find out what’s going on in their world and most of all talking to some new and developing co-ops; from a potential new punk venue in Sheffield, to the co-op looking at new ways of delivering homecare around Manchester. 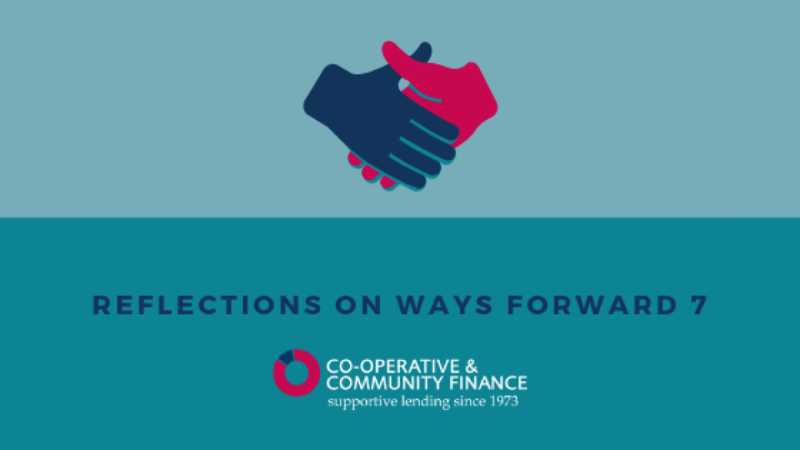 The energy and enthusiasm of this new generation of co-operators is infectious, and as I travelled the long journey back to Southampton on a packed train I felt inspired and determined to look at how we, as a co-operative lending institution can help make things happen.